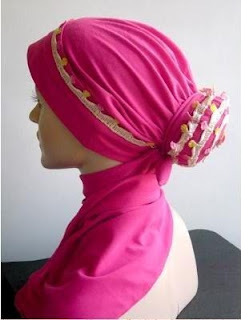 I know it's annoying when you see all these beautiful things from foreign designers which we can't get our hands on, but you can find some similar turbans at Hijab Store Online. These would be perfect with a maxi dress for a special occasion. 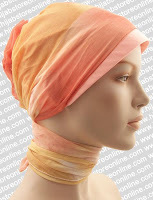 They simply slip onto the head, and the scarf extends at the back. You can then use this to wrap around your neck (though you still need to wear a roll-neck top anyway) or over the chest, depending on your dress. 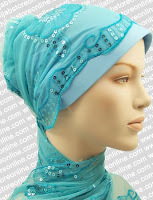 They remind me a lot of the Indonesian style hijabs as seen here. Are these an option you would go for? Beautiful yes, but no thank you..they leave a great bit of neck under the chin uncovered. And whatabout covering the chest? Anon, did you actually READ what I had written? Yea exactly, if u pin it up the neck doesnt show. I went to the Egyptian website and these are beautiful. You chose some of the best to show us, though. Not sure if I would wear most of them, but they are great to look at. Salams to all, Anon from Finland. I think they are very pretty. I like the second one (green and pink). For my wedding my grandmother made the lace and satin headpiece and my mother and I embroidered it with beads. It turned out so pretty and special. I would love to give it to my daughter someday. 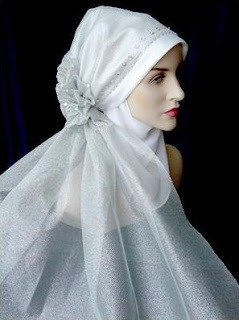 i met a lady from egypt the other day, and she had one of these ontop of a normal hijab, its hard to explain the way she done it was so unusual but covered all that needed to be covered, but mashallah she looked so beautiful. I think they are pretty. My gosh about the semi-fight going on in here about these not being Islamic, etc. 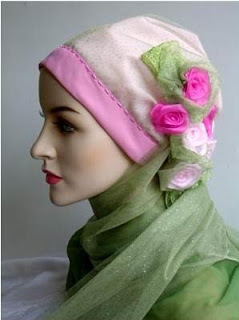 Anon, take what you want from the pictures and this hijab style and others will take away what they want from it. It may not fulfil your beliefs on what is and isn't hijab, but for others, it might, or it might be a step towards covering up more. Who knows?